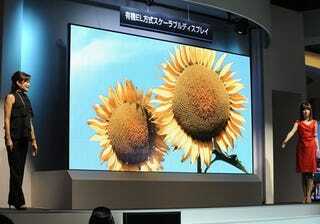 It may be lagging three inches behind Panasonic's big telleh, but Mitsubishi's whopping great screen is OLED. Or should that be ZOLED? It was unveiled at ISE 2010, with Number 6 and Boomer dressy-likeys lending a hand.